Restless Energy | Food and Drink | Style Weekly - Richmond, VA local news, arts, and events. FOOD REVIEW: The Rogue Gentlemen pushes into new territory. 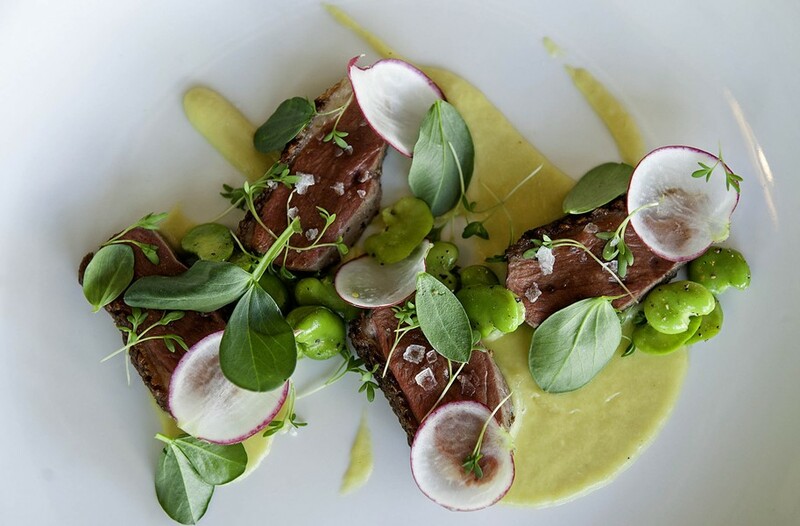 Scott Elmquist Seared moulard duck breast is served with fava beans, greens, radish, leek soubise and peppercress, at the Rogue Gentlemen in Jackson Ward. Cocktails aren't my thing — I'm a certified beer lover who's flirted with home brewing and celebrates Richmond's surging embrace of the craft brewing revolution. The Rogue Gentlemen, however, threatens to make a convert of me with its pre-Prohibition cocktails and techniques. On a recent slow weeknight, I order the dealer's choice ($11), putting my fate in the bartender's hands. After describing my taste in beer and the few cocktails I know by name, I'm handed a bitter twist on a dark and stormy that's been spiked with Campari. The temptation to test the bartender's creativity is too much to avoid. I order another dealer's choice, requesting a different flavor profile. This could be a dangerous addiction. The center of Richmond dining may be shifting west from the current hotspot, Church Hill — not out to the suburbs, but rather just across the oddly wide Martin Luther King Jr. Memorial Bridge to Jackson Ward. While some of the old stalwarts such as Tropical Soul and Croaker's Spot, which nurtured a self-conscious connection to the neighborhood's black history, have closed or moved, there's no shortage of new restaurants taking their place. Lucy's, Sweetopia and Saison with its soon-to-open market offer plenty of options for Jackson Ward. Entering this mix is the recently opened cocktail-focused restaurant, the Rogue Gentlemen. Chef and owner John Maher and executive chef Aaron Hoskins have cooked, consulted, and staged popup restaurants across town, and are well-known for bringing high standards, creativity and a bit of attitude to their ventures. Décor is simple, with an exposed brick wall adorned by gold-framed mirrors, straightforward furniture and a back bar built from pine. While I might have expected more given the pre-opening media buildup and evocative name, the simplicity works well enough for me to focus on the food and drink. My only wish is that there were some kind of nod to the neighborhood's rich history. The menu is modern Richmond foodie — or is that early-21st-century American foodie? Described as farm-to-table, though I never saw a list of farms, it's heavy on trends. Expect to find pork belly, offal, foie gras and charcuterie. But these trends are delicious and for the most part well-executed. A small plate of roasted bone marrow ($10) is topped with sea salt and served with house-made pickles and brioche. The smart pairing of earthy marrow offset by acidic pickles and a sweet, starchy bread, makes a great side for my cocktails. The foie gras pot de crème, a custard, is similarly well paired with compressed pear and brioche. Large plates range from vegetarian risotto ($15) to duck breast ($22). The pork belly ($17) is too generous a portion for me to finish. A smear of spicy aioli and the accompanying fennel and potatoes helps cut through the rich fattiness inherent in the dish. Unfortunately, one piece has a beautifully crisp exterior but the fat isn't fully rendered. Brunch makes good use of leftover brioche, with sausage in Yorkshire pudding ($7), french toast ($10) and bread salad ($7), which is served with burrata cheese and pear but would benefit from more depth of flavor. I recommend the beef short rib ($12), which is served with bone marrow, root vegetable hash, chimichurri sauce and fried eggs. The combination is a comforting, hearty and inventive take on the classic potato, egg and meat breakfast combination. Options for food can be overwhelming. In addition to the regular dinner menu there's the brunch menu, a bar menu, a couple of tasting menus and Monday supper. It can be difficult to decide when to go and what your best options are. The good news is that despite a few missteps from the kitchen on my visits, it's generally hard to go wrong. And the restaurant's clear commitment to innovation means it will be restless in the best possible way. One night the bartender successfully re-carbonates a bottle of expensive champagne that's gone flat — not to sell to customers but for the joy and challenge of it. It's that genuine love of and curiosity about food and drink that makes the Rogue Gentlemen a place worth visiting.